With articles like this coming out of Time magazine, it is inevitable that in the immediate future, the United States will be split into two partisan camps. However, this will not be the traditional schism of republicans vs. democrats, contrary to Mr. Barney Frank's attempt to start ideological partisan warfare. The real split will be of naive, easily-manipulated, small-time mom and pop investors, who only care about looking at their daily yahoo finance screens and 401(k) statements, seeing more black than red, and only focusing on what happened in the immediate past, and the forward looking taxpayers, who see the upcoming budget deficit fiasco, the social security ponzi scheme, the Medicare/Medicaid debacle, the ridiculous underfunding in public and corporate pension funds, the rising city and state taxes, the shuttering factories, the rising unemployment, the plummeting American production base, the "seasonally" upward-adjusted economic data coupled with consistently downward revised prior economic releases, the increasing savings rate and the multi trillion discrepancy in consumer purchasing power. The taxpayers are becoming angrier and angrier at the net present value destruction of future opportunities of being a U.S. citizen, while investors cheer every piece of information (whether or not supported by facts) that provides a push to their current net worth, ignorant of what this may mean for the future. There will come a point where this schism reaches a boiling point, in the meantime, the paradox is that so many of the taxpayers are also investors, who are caught in a tug of war with themselves on what the proper response to the crisis should be: happy as a result of bear market rallies, or sad when they put the facts into perspective. Speaking of facts, Time contributing author Douglas McIntyre may have considered presenting some to justify his thesis that the "the great banking crisis of 2008 is over." Pointless regurgitation of secondary viewpoints serves no purpose in the mainstream media, especially not in formerly reputable mainstream media such as Time (Zero Hedge's subscription is running out with no plans for renewal). It is even worse when the MSM represents as "facts" the disinformation by banks, who claim that the downward inflection point has been reached and ignore the full context: a much weaker mark-to-market methodology, the FDIC and SEC aiding and abetting wholesale "pennies on the dollar" blue light specials of bankrupt banks such as Wachovia and Washington Mutual, taxpayer funnels such as AIG being used to pad the top and bottom line, a financial system balance sheet which has over 70% of its assets guaranteed by the Fed and the Treasury, and lastly, a spike in commercial real estate deterioration to unprecedented levels. Mr. McIntyre's article is childish and unsubstantiated to the point of generating derisive laughter from his readers. Then again, a casual glance of his self-description in Seeking Alpha is enough to put his opinion into perspective: Mr. McIntyre "knows technology cold, has a sharp understanding of what's priced-in to [sic] stocks, and writes extremely well (as you'd expect)." How a self-ascribed technology specialist (who writes "so well" that he makes grammatical mistakes in the very same sentence making that claim) ends up stating "the financial crisis is over" is beyond Zero Hedge's meager attempts at comprehension. What Zero Hedge is not beyond, however, is presenting the facts and not perpetuating the disinformation fallacy. The cold facts - "When you stare at the abyss, the abyss stares back at you." Why is everyone so afraid to stare at the proverbial abyss? Readers of Zero Hedge know all too well, about my fascination with the economic fundamentals, and my desire to expose the real abyss in all its deep glory. I dare anyone: McIntyre, Kudlow, Geithner, Obama, to look at the chart below and tell me we are in a V shaped recession. Yes, ISM may be bottoming (at record low levels which is not indicative of much), and unemployment may soon be bottoming (it has not, yet somehow the market believes it is just a matter of time), however one look at the chart of accelerating commercial real estate delinquencies and what they mean for the multi-trillion commercial real estate market should stop any V-recovery fans dead in their tracks. I will present some more factual glances of the abyss, compliments to the good folk at Realpoint. 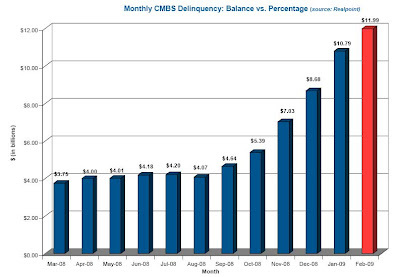 Through the February 2009 reporting period, the delinquent unpaid balance for CMBS increased by a substantial $1.2 billion, up to a trailing 12-month high of $11.99 billion. 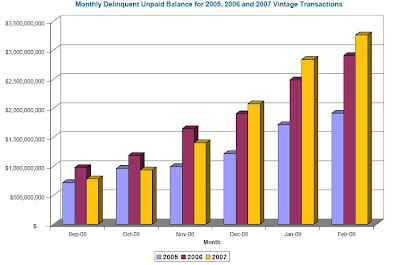 Overall, the delinquent unpaid balance grew for the sixth straight month, up over 244% from one-year ago (only $3.48 billion in February 2008) and now over five times the low point of $2.21 billion in March of 2007. While a slight decline was noted in the 30-day and 60-day delinquent loan categories, the distressed 90+-day, Foreclosure and REO categories grew for the 15th straight month – up over 216% in the past year. This increase took place despite another $53.9 million in loan workouts and liquidations reported for February 2009 across 20 loans. Ten of these loans at $19.1 million, however, experienced a loss severity near or below 1%, most likely related to workout fees, while the remaining 10 loans at $34.8 million experienced an average loss severity near 46%. As additional pressures are placed on special servicers to maximize returns in today’s market, loss severities are expected to increase while liquidation activity is expected to slow further as fewer transactions occur. This would be the result of reduced or distressed asset pricing, lower availability of funds, and increased extensions of balloon defaults through the end of 2009 and into 2010. The total unpaid balance for all CMBS pools under review by Realpoint was $837.78 billion in February 2009, down from $842.8 billion in January. Both the delinquent unpaid balance and delinquency percentage over the trailing twelve months are shown in the chart above and the one below, clearly trending upward for the timeline. 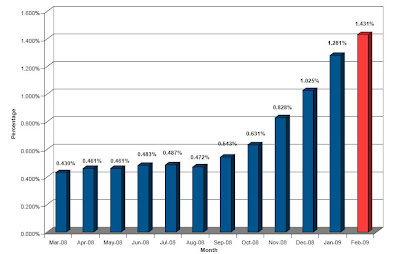 The resultant delinquency ratio for February 2009 increased to 1.431% from 1.281% one month prior. Such ratios above 1% reflect levels not seen in since April 2005. What is more concerning, however, is that the delinquency percentage through February 2009 is more than three times the 0.399% reported one-year prior in February 2008. The increase in both delinquent unpaid balance and delinquency ratio over this time horizon reflects a slow but steady increase from historic lows through mid-2007. 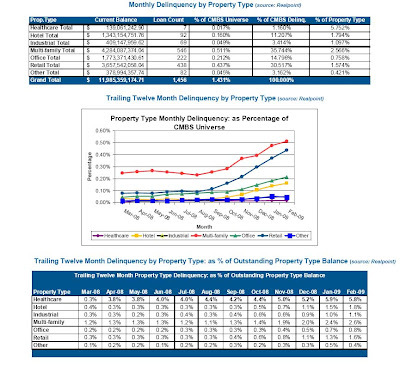 Over the past three months, delinquency growth by unpaid balance has averaged roughly $1.65 billion per month, while the outstanding universe of CMBS under review has decreased on average by $3.5 billion per month from pay-down and liquidation activity. If such delinquency average were again increased by an additional 25% growth rate, and then carried through the end of 2009, the delinquent unpaid balance would top $32 billion and reflect a delinquency percentage slightly above 3.8% by December 2009. In addition to this growth scenario, if one adds the potential default of the $3 billion Peter Cooper Village / Stuyvesant Town loan and the $4.1 billion Extended Stay Hotel loan, the delinquent unpaid balance would top $39 billion and reflect a delinquency percentage near 5% by December 2009. Special servicing exposure has also been on the rise, having increased for the 10th straight month to $17.11 billion in February 2009 from $14.38 billion in January 2009 and only $12.78 billion in December 2008. The corresponding percentage of loans in special servicing has also increased to 2.04% of all CMBS by unpaid balance, up from only 0.50% in both February 2007 and 0.67% February 2008. 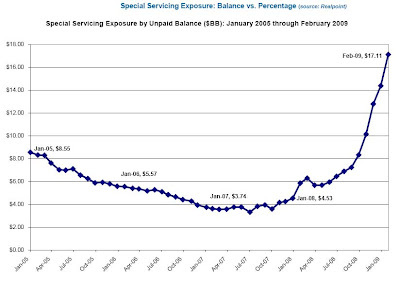 The overall trend of special servicing exposure since January 2005, by both unpaid balance and percentage, is presented in Charts 3 and 4 below. Realpoint's default risk concerns for the more recent 2005 to 2007 vintage transactions relative to underlying collateral performance and payment ability are more evident on a monthly basis. Both the volume and unpaid balance of CMBS loans transferred to special servicing on a monthly basis continues to raise questions about underlying credit stability in today’s market climate for these deals, as evidenced by attached table. 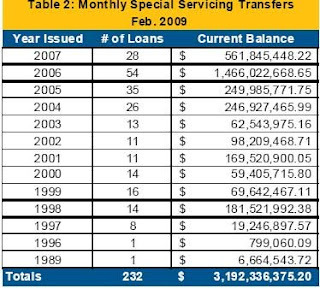 An additional 117 loans at $2.28 billion issued from 2005 through 2007 were transferred to special servicing in February 2009, mostly (but not only) for delinquency. Such figure reflected 71% of the current month’s transfers and 13% of total special servicing exposure in February 2009. Furthermore, over 51% of delinquent unpaid balance through February 2009 came from transactions issued in 2006 and 2007, with over 27% of all delinquency found in 2007 transactions. Extending a review to include the 2005 vintage, an additional 16% of total delinquency is found meaning over 67% of CMBS delinquency comes from the 2005 to 2007 vintage transactions. The chart below shows the increased delinquent unpaid balance relative to these three vintages over the past six months, clearly reflecting the increasing trends highlighted in recent months. Throughout 2009, it is expected to see high delinquency by unpaid balance for these three vintages due to aggressive lending practices prevalent in such years. Also some loans from the 2008 vintage are expected to show signs of distress and default in cases where pro-forma underwriting assumptions fail to be met at the property level. Deals seasoned at least a year have a total unpaid balance of $822.94 billion, with $11.661 billion delinquent – a 1.42% rate (up from 0.5% six months prior). When agency CMBS deals are removed from the equation, deals seasoned at least a year have a total unpaid balance of $793.3 billion, with $11.656 billion delinquent – a 1.47% rate (up from 0.52% six months prior). Conduit and fusion deals seasoned at least a year have a total unpaid balance of $701.2 billion, with $10.78 billion delinquent – a 1.54% rate (up from 0.54% six months prior). 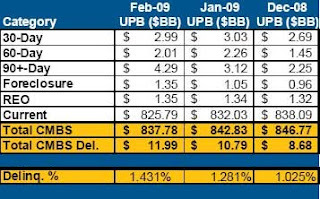 Balloon default risk related to upcoming anticipated repayment dates (ARD's) or term maturity from highly seasoned transactions for both performing and non-performing loans coming due in the next 12 months that may be unable to secure adequate refinancing due to current credit market conditions, lack of financing availability, or further distressed collateral performance. Refinance and balloon default risk concerns from floating rate transactions, as many large loans secured by un-stabilized or transitional properties reach their final maturity extensions, or fail to meet debt service or cash flow covenants to exercise such extensions. Aggressive pro-forma underwriting on loans with debt service / interest reserve balances declining, more rapidly than originally anticipated, on a monthly basis. Further stress on partial-term interest-only loans that begin to amortize during the year that already have in-place DSCRs hovering around breakeven. The unpaid balance related to loans underwritten in the past three years with DSCRs between 1.10 and 1.25 is very high, and any decline in performance in today’s market could cause an inability to make debt service requirements. A decline in distressed asset sales or liquidations as traditional avenues for securing new financing is becoming less available. Additional stress on both the retail and lodging sectors as consumer spending declines and the U.S. economy weakens. The rate at which liquidated or problematic CMBS credits are replenished by newly delinquent loans remains a concern, especially regarding further growth to Foreclosure and REO status (evidence of additional loan workouts and liquidations on the horizon for 2009). Through February 2009, newly reported CMBS delinquency continued to outpace monthly liquidations by a very high ratio, raising concerns for further deterioration in the market. In February 2009, 10 loans for $34.8 million experienced an average loss severity near 46% - a clear reflection of true loss severity in today’s credit climate. Higher levels of loss severity will be the norm in 2009 for those loans that experience a term default where cash flow from operations is not sufficient to support in-place debt obligations. Since January 2005, over $7.52 billion in CMBS liquidations have been realized, while 44 of the trailing 49 months have reported average loss severities below 40%, including 21 below 30%. While average loss severity increased slightly for the 12 months of 2007 when compared to 2006, monthly loan liquidations by unpaid balance declined significantly in 2007 when compared to 2006 (by 43% year-over-year). Liquidations in 2007 totaled $1.094 billion at an average severity of only 32.8%. Liquidations in 2006 totaled $1.93 billion at an average severity of only 30.2%, while 2005 had $3.097 billion in liquidations at an average severity of 34.2%. The highest loss severities in 2006 were found in healthcare (55%) and industrial (34.5%) collateral; multifamily collateral remained highest by balance before liquidation ($606.7 million), but reported the lowest severity (24.5%). The highest loss severities in 2007 were found in industrial (50%) and healthcare collateral (44%); multifamily collateral was again highest by balance before liquidation ($356 million), but reported the fourth lowest severity (32.5%). The highest loss severities in 2008 were found in mixed-use / other (36%) and multifamily collateral (31%); multifamily collateral was again the highest by balance before liquidation ($576.97 million). The total balance of loans in Foreclosure and REO increased for the 16th straight month to $2.696 billion from $2.39 billion in January 2009, despite ongoing liquidation activity. These figures had declined steadily for some time through mid-2007, reflective of expedited loan work outs, but continue to be replenished with new loans due to aggressive special servicing workout plans. 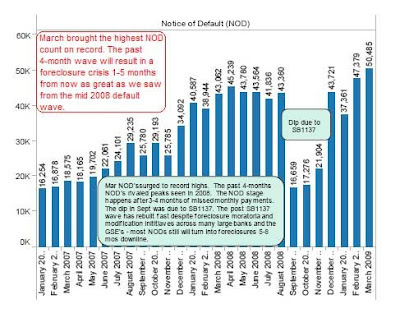 The chart below also shows the rapid growth of loans reflecting 30-day delinquency in the later half of 2008, transitioning rapidly into more distressed levels on a monthly basis, thus supporting the use of 30-day defaults as an early indicator of workouts to come in 2009. Multifamily loans remained a poor performer in January 2009, with over a 2.5% delinquency rate (up from only 0.9% in January 2008 – over a 177% increase). Multifamily loans also are the greatest contributor to overall CMBS delinquency, at 0.51% of the CMBS universe and over 35% of total CMBS delinquency (but down slightly for the second straight month). 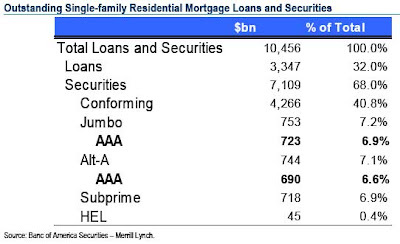 By dollar amount, multifamily loan delinquency is now up by an astounding $3.38 billion since a low point of only $903.3 million in July 2007. As shown in Chart 7 below, multifamily, retail, office and hotel collateral loan delinquency as a percentage of the CMBS universe have clearly trended upward since mid-2008. Only seven healthcare loans at 0.017% of the CMBS universe are delinquent, but such delinquent unpaid balance reflects 5.8% all healthcare collateral in CMBS. 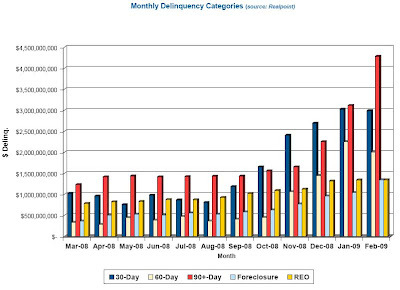 As a percentage of total unpaid balance, year-over-year delinquencies for all categories increased by triple digits from February 2008 to February 2009. In 2009 retail delinquency will increase substantially as consumer spending suffers from the overall weakness of the U.S. economy. 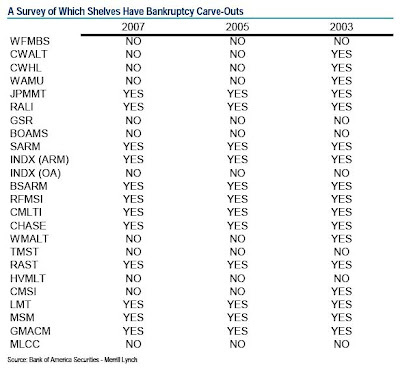 Store closings and retailer bankruptcies will continue throughout the year. In addition, the hotel sector will likely experience an increase in delinquency as both business and leisure travel slows further. The top three states ranked by delinquency exposure through January 2009 changed as California surpassed Michigan in third position. This remained the same through February 2009. Together with Texas and Florida, these three states collectively accounted for 30% of CMBS delinquency. Previously in November 2008, New York had passed Michigan and moved into third place in the rankings, following the reported delinquency of the Riverton Apartments loan at $225 million (CD07CD4). New York is now in the fifth position when ranked by delinquent unpaid balance. The 10 largest states by delinquent unpaid balance reflect 62% of CMBS delinquency, while the 10 largest states by overall CMBS exposure reflect 53% of the CMBS universe. The state of Texas remains a major concern at over 11.5% of CMBS delinquency, concentrated within the Houston and Dallas-Fort Worth, MSAs (almost 9% of CMBS delinquency); however, such MSAs reflect a fairly low percentage of total exposure in their respective MSAs (at less than 3.4%). Four MSAs topped 4% of CMBS delinquency in February 2009 (up from three a month prior). 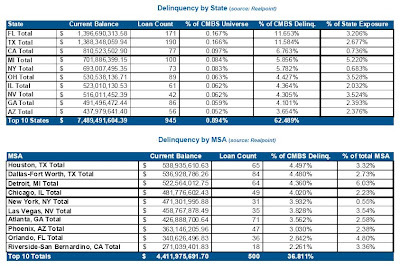 The 10 largest MSAs by delinquent unpaid balance reflect 37% of CMBS delinquency, while the 10 largest MSAs by overall CMBS exposure reflect 34% of the CMBS universe. ...And the facts go on and on and on... yet not one of them is mentioned in McIntyre's "analysis". Commercial real estate is nothing more than a proxy for the intersection of the two historically core driving forces in the U.S. economy: real estate values and business conditions. And as the facts above indicate, the deterioration is only starting to pick up. But what about all the stimulus programs skeptics will ask? The bail out packages? The constant funneling of taxpayer money into every underperforming segment of economy? The truth is that the more taxpayer money is dumped to try to fill the abyss, it may become marginally shallower, but only at the expense of it geting wider. At some point soon (if not already), the U.S. economy will be unweenable from the trillions and trillions of taxpayer subsidies all the while it becomes more indebted to both its investors and taxpayers, further exacerbating the abovementioned paradox (presumably not without a motive). As the multi-trillion CRE crash continues to deplete the left side of the financials' balance sheet with an exponentially growing pace (and I have not even touched on the credit card topic), the banks will be left scratching their heads what accounting rules to bend, which insurance companies to implode and get another AIG-like piggybank, how to break REG-FD more and more creatively with select memo leaks, how to manipulate the market, and how to make the Tsy curve becomes even more upward sloping with the compliments of the Fed and the Treasury. In the meantime the disinformation rift between the American taxpayers and investors will keep growing until inevitably, one day, it will escalate to the point where empty promises on prime time TV by the administration's photogenic representatives will not suffice, and real actions that benefit future American generations will be demanded... What happens after I have no idea. The list is enough to provide enjoyable weekend long reading. Easily some of the funniest stuff seen in a long time, yet somehow it makes its way straight to the FDIC's website. One wonders if all these entities were aware their e-mails would end up for public viewing and amusement, and if so whether they would have submitted them in the first place. - Investcorp's own Christopher Hoeffel, president of the Commercial Mortgage Securities Association and likely conflicted beyond repair. I would like to highlight the following fabulous e-mails which collectively encapsulate the feelings of Zero Hedge, and don't hide their warm feelings toward miss Sheila Bair. Among these, the letter by Mr. Benn Dover III's is a truly inspiring missive. "Anyone who is doing anything sensible right now is either losing money or is out of the market entirely." These are the words of a quant trader, who is seeing something scary in the capital markets. Scary enough to merit a warning that we could be on the verge of another October 87, August 2007, or January 2008. Let's back up. I recently posted a chart which tracks equity market neutral strategies: in essence a cross section of quant funds for which there is public performance tracking. The chart is presented below. There is not much publicly available data to follow what goes on in the mystery shrouded quant world. However, another chart that tracks the market neutral performance is the HSKAX, or the Highbridge Statistical Market Neutral Fund, presented below. As one can see we have crossed into major statistically deviant territory, likely approaching a level that is 6 standard deviations away from the recent norms. What do these charts tell us? In essence, that there is a high likelihood of substantial market dislocations based on previous comparable situations. More on this in a second. Why quant funds? Or rather, what is so special about quant funds? The proper way to approach the question is to think of the market as an ecosystem of liquidity providers, who, based on the frequency of their trades, generate a cushioning to the open market trading mechanism. It is a fact that the vast majority of transactions in the market are not customer driven buy/sell orders, but are in fact high frequency, small block trades that constantly cross between a select few of these same quant funds and program traders. This is a market in which the big players are Renaissance Technologies Medallion, Goldman Sachs and GETCO. Whereas the first two are household names, the last is an entity known primarily to quant market participants. Curiously, the Philosophy section in GETCO's website exactly captures the critical role that quant funds play in an "efficient" market. GETCO’s strategy is to align our business plan with what is best for the marketplace. We earn our revenues by providing enhanced liquidity and efficiency to electronic financial markets, which in turn results in lower costs for market participants (e.g. mutual funds, pension funds, and individual investors). In addition to actively trading, we partner with many exchanges and their regulators to increase transparency throughout the industry and to create more efficient means for the transference of financial risk. 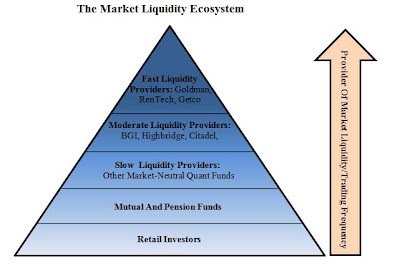 A good example to visualize the dynamic of this liquidity "ecosystem" is presented below. In order to maintain market efficiency, the ecosystem has to be balanced: liquidity disruptions at any one level could and will lead to unexpected market aberrations, such as exorbitant bid/ask margins, inability to unwind large block positions, and last but not least, explosive volatility: in essence a recreation of the market conditions approximating the days of August 2007, the days post the Lehman collapse, the first November market low, the irrational exuberance of the post New Year rally, and the 666 market lows. 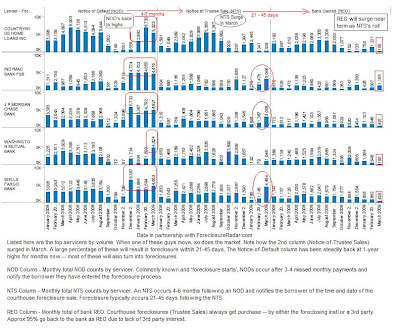 The above tracking charts indicate that something is very off with the "slow", "moderate" and "fast" liquidity providers, indicating that liquidity deleveraging is approaching (if not already is at) critical levels, as the vast majority of quants are either sitting on the sidelines, or are merely playing hot potato with each other (more on this also in a second). What this means is that marginal market participants, such as mutual and pension funds, and retail investors who are really just beneficiaries of the liquidity efficiency provided them by the higher-ups in the liquidity chain, are about to get a very rude awakening. Also, it needs to be pointed out that the very top tier of the ecosystem is shrouded in secrecy: conclusions about its state can only be implied based on observable metrics from the HSKAX and HFRXEMN. It is safe to say that any conclusion drawn based upon observing these two indices are likely not too far off the mark. 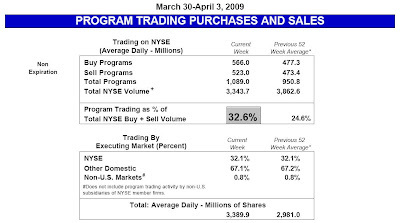 According to the NYSE, last week program trading was 8% higher than the 52 week average, which on almost 4 billion shares is a material increase. It is probably safe to say that the 1 billion in program trades last week does not account for significant additional low- to high-frequency trades originated at non NYSE members, implying the real number for the overall market is likely even higher. 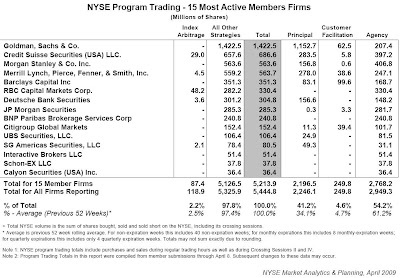 Some more program trading statistics: principal trading is running 21% above 52 week average, agency trading is 11% below average, while NYSE weekly volume is running about 9% below 52 wk average. Following on the circumstantial evidence track, as Zero Hedge pointed out previously, over the past month, the Volume Weighted Average Price of the SPY index indicates that the bulk of the upswing has been done through low volume buying on the margin and from overnight gaps in afterhours market trading. The VWAP of the SPY through yesterday indicated that the real price of the S&P 500 would be roughly 60 points lower, or about 782, if the low volume marginal transactions had been netted out. And yet the market keeps on rising. This is an additional data point demonstrating that the equity market has reached a point where the transactions on the margin are all that matter as the core volume/liquidity providers slowly disappear one by one through ongoing deleveraging. Unfortunately for them, this is not a sustainable condition. As more and more quants focus on trading exclusively with themselves, and the slow and vanilla money piggy backs to low-vol market swings, the aberrations become self-fulfilling. What retail investors fail to acknowledge is that the quants close out a majority of their ultra-short term positions at the end of each trading day, meaning that the vanilla money is stuck as a hot potato bagholder to what can only be classified as an unprecedented ponzi scheme. As the overall market volume is substantially lower now than it has been in the recent past, this strategy has in fact been working and will likely continue to do so... until it fails and we witness a repeat of the August 2007 quant failure events... at which point the market, just like Madoff, will become the emperor revealing its utter lack of clothing. So what happens in a world where the very core of the capital markets system is gradually deleveraging to a point where maintaining a liquid and orderly market becomes impossible: large swings on low volume, massive bid-offer spreads, huge trading costs, inability to clear and numerous failed trades. When the quant deleveraging finally catches up with the market, the consequences will likely be unprecedented, with dramatic dislocations leading the market both higher and lower on record volatility. Furthermore, high convexity names such as double and triple negative ETFs, which are massively disbalanced with regard to underlying values after recent trading patterns, will see shifts which will make the November SRS jump to $250 seem like child's play. For readers curious about just how relevant liquidity is in the current market, I recommend another recent post that discusses DE Shaw's opinion on the infamous basis trade, in which their conclusion was that establishing a basis trade, which is effectively the equivalent of selling a put option on market liquidity, ended up in massive financial carnage as the market rolled from one side of the trade to another. Is it possible that what the basis trade was for credit markets (most notably Citadel, Merrill and Boaz Weinstein), so the quant unwind will be to equity markets? The Treasury is looking to hire BCG to assist with the plan for GM and Chrysler going forward. This is bound to spark outrage mostly because of the fees (up to $7MM) and also the feeling that the government is once again looking to pad the pockets of those capitalist fatcats. However, we view this as a positive sign. The government is showing serious signs of wanting to ACTUALLY fix the problem effectively. Leaving aside politics, this is a marked difference from the Bush administration which had a penchant to appoint unqualified idiots to positions, solely based on their pre-campaign proximity to the power base. Obama & Co. have moved away from the mindset that the Federal gov't is their private treehouse and towards a results-oriented approach. This has been evident in a number of actions including the (failed) hiring of Nancy Killefer, keeping on Robert Gates as SecDef, and now this. By showing that they are willing to swallow their ego and ask (and pay) for outside help, this is encouraging news that GM/Chrysler may not continue to be a cash sinkhole indefinitely. Aside from their horrible hunter-green color scheme, BCG is a solid choice to execute this project. There is a valid argument to be had about the effectiveness of the management consulting industry as a whole, and whether there was a better alternative (Treasury guys, existing GM/Chrysler strategy groups) but this strikes us as situation where the government made a likely unpopular decision that they believe will lead to the best outcome. The only real criticism we have is that the Treasury should have at least negotiated the fees a little. At a time like this, BCG's auto practice must be desperate for work and would certainly have done it for a lot less (especially given the marquee nature of the assignment). Attached is a chart I will discuss tomorrow... For those in the know I would love to hear your thoughts. 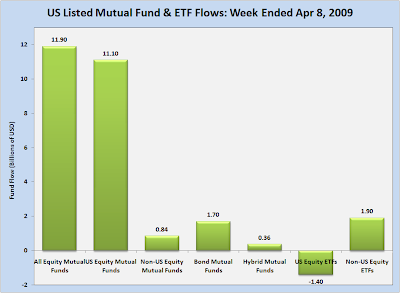 Trim Tabs has released its weekly mutual fund flow data: the company estimates that all equity mutual funds posted an inflow of $11.9 billion in the week ended Wednesday, April 8, versus a revised inflow of $3.0 billion in the previous week. Equity funds that invest primarily in U.S. stocks posted an inflow of $11.1 billion, versus a revised inflow of $2.7 billion in the previous week. Equity funds that invest primarily in non-U.S. stocks had an inflow of $844 million, versus a revised inflow of $287 million in the previous week. In addition, bond funds had an inflow of $1.7 billion, versus a revised inflow of $6.8 billion in the previous week, and hybrid funds had an inflow of $361 million, versus a revised inflow of $409 million in the previous week. Separately, TrimTabs reports that exchange-traded funds (ETFs) that invest in U.S. stocks posted an outflow of $1.4 billion for the second consecutive week. ETFs that invest in non-U.S. stocks had an inflow of $1.9 billion, versus an inflow of $502 million in the previous week. Life insurer Genworth Financial dropped 22% after the Office of Thrift and Supervision said it had declined the company's application to become a savings and loan holding company. As the insurance company had previously lost access to the CPFF commercial paper program subsequent a rating agency downgrade, the loss of the TARP option could be a terminal development: CEO Michael Frazier had said: "The TARP application was one of the strategic levers Genworth has considered to provide another level of capital flexibility to address unforeseen events, and the nature of that program has continued to evolve." Following the final release of February numbers, Brad Setser has an interesting piece to frame what's going on and why the "green shoots" are a fakeout from the equity bulls. It was interesting to see his conclusions align with a number of our previous posts including Japanese demand and export outlook, the true story and medium term outlook on international trade flows, and the macro factors for oil and indirectly the macro drivers on prices. However, it also got us thinking on what the future holds for trade flows. It has been clear that the US consumer has been the driving force of the global economy and will be the constituency to lead us out of this depression. However, we can be sure that they will not be shouldering as much of the load this time due to the crushing and traumatic effects of the deleveraging process and its direct contact with the consumer. In a sign of the times, the US savings rate is FINALLY showing signs of revival and we are inclined to think that the "stable" savings plateau (once demand returns) will be materially higher than what we have been seeing recently. The question then becomes who will fill in the gaping hole of US consumer demand? We think that by identifying the potential demand hole fillers and then actively looking for signs of recovery in that group gives the best option to call the bottom - not the lazy technicals approach to a large macro picture that seems the be the approach du jour with the Jim Cramer set. With a big sheaf of disclaimers and contingencies, we'd like to put forward two potential groups as preliminary "the next big thing(s)". The coverage of the trauma that the Chinese have had to face while holding USDs is sufficient for a Lifetime movie. Going forward, they have a few options - as hypothetical policy makers, it seems reasonable to us that this would be a great time to finally allow the RMB to float and let the middle class enjoy some Johnny Walker Blue once or twice a year. However, this is a case where the classroom is miles away from reality. The political implications alone are sufficient to stillbirth this thing as it will become increasingly harder and harder to reconcile the effects on Chinese society and the Communist ideal. The optics alone would be traumatic; can you imagine a smiling middle class Chinese family at Disneyworld Shenzhen on the cover of the Economist? Complicating matters is the fact that most, if not all, economic data coming out of China is unreliable; attempting to generate an up to date picture will become a process of elimination i.e. (1 - rest of world). However, the other options are not particularly appealing either. The various reserve currency ideas all fall prey to fundamentally the same problem; you can't export like mad and keep your currency weak indefinitely. It just doesn't work, much the same way that you cannot count on asset appreciation to be the main source of your wealth generation. It is unreasonable to expect an overnight change to have the current account surplus flowing to the Chinese people (and subsequently increase in Chinese demand) but the hope is that enough happens to make it matter. This may be the opportunity for Japan to finally emerge from zombie status. The cause of the "lost decade" (and this decade too) is a big steaming bowl of zaibatsu, unsophisticated/slow/corrupt/ineffective government, a risk-averse investor mentality, and a culture being dragged, kicking and screaming, into the 21st century. We have been extremely bearish on Japan (and we still think there is more room to disappoint) but there are a number of extremely powerful factors that have the potential to finally reverse the course of the economy. Firstly, the demographic picture is likely to generate some change solely on its own. The Japanese baby boomers are going to start dropping, and as they do so their massive savings are going to trickle down to the next generation. Secondly, Japan has long fought the inexorable movement from a manufacturing economy to a service economy. Historically, the Meiji era was a turbocharged period that moved Japan from agriculture to manufacturing but the past 50 years have been the inverse of that for the journey from manufacturing to service. At a really macro perspective, it's astonishing that Japan has been stuck in "manufacturing" mindset and mode for as long as it has. However, our hope is that the massively traumatic drops in exports will highlight the weakness of the current system/model/mentality and will generate a combination of economic evolution and intelligent design to move Japan along. Third, Japan's financial institutions have plodded along since the early 90s. We haven't closely been following the situation there but due to the inherent low leverage of the Japanese system, we can't help but figure that the financial system has to come out of this mess marginally better - if nothing else, at least in a comparative sense. This is a topic that needs to be closely watched and explored. There are a few smaller factors, but those are the big ones. The decreasing Japanese savings rate has caught a lot of attention but a lot of other macro factors need to get in line before we believe that it will become sustainable. Another quick point to make is that if Japan does recover (if at least marginally) AND they allow the yen to float without central bank intervention, the resulting strength in the yen could become THE macro story for the next few years following. As the current generation of arubaito continue to mature, the potential for the Japanese to generate demand will really take off. As we have mentioned, there are a whole host of things that could derail our thought process above. Additionally, the political and cultural aspects are critical at every level for this to happen. However, we believe these groups are worth closely keeping tabs on; at the least, no painting of a global rebound picture can occur without a firm story coming out of this subset. Spreads were tighter in the US today as all the indices improved. Indices typically underperformed single-names with skews mostly narrower (index arb in HVOL is clear) as IG underperformed but narrowed the skew, HVOL underperformed but narrowed the skew, ExHVOL outperformed pushing the skew wider, XO underperformed but compressed the skew, and HY outperformed but narrowed the skew. The names having the largest impact on IG are Textron Financial Corp (-252.61bps) pushing IG 1.89bps tighter, and COX Communications Inc. (+9bps) adding 0.07bps to IG. HVOL is more sensitive with Textron Financial Corp pushing it 8.85bps tighter, and Carnival Corp. contributing 0bps to HVOL's change today. The less volatile ExHVOL's move today is driven by both National Rural Utilities Cooperative Finance Corporation (-50bps) pushing the index 0.49bps tighter, and COX Communications Inc. (+9bps) adding 0.09bps to ExHVOL. The price of investment grade credit rose 0.31% to around 96.44% of par, while the price of high yield credits rose 0.94% to around 74.63% of par. ABX market prices are lower by 0.02% of par or in absolute terms, 0.43%. Broadly speaking, CMBX market prices are higher (improving) by 0.08% of par or in absolute terms, 0.23%. Volatility (VIX) is down -1.67pts to 37.32%, with 10Y TSY selling off (yield rising) 6.3bps to 2.92% and the 2s10s curve steepened by 3.9bps, as the cost of protection on US Treasuries fell 3bps to 49bps. 2Y swap spreads tightened 0.3bps to 57bps, as the TED Spread tightened by -0.4bps to 0.96% and Libor-OIS improved 0bps to 93.1bps. The Dollar strengthened with DXY rising 0.19% to 85.526, Oil rising $2.33 to $51.71 (outperforming the dollar as the value of Oil (rebased to the value of gold) rose by 4.92% today (a 4.91% rise in the relative (dollar adjusted) value of a barrel of oil), and Gold dropping $1.68 to $878.82 as the S&P rallies (845 2.72%) outperforming IG credits (182.25bps 0.32%) while IG, which opened tighter at 189bps, underperforms HY credits. IG11 and XOver11 are -6.63bps and -48bps respectively while ITRX11 is -4.75bps to 157.25bps. Dispersion fell 11.6bps in IG. Broad market dispersion is a little greater than historically expected given current spread levels, indicating more general discrimination among credits than on average over the past year, and dispersion increasing more than expected today indicating a less systemic and more idiosyncratic spread widening/tightening at the tails. 54% of IG credits are shifting by more than 3bps and 61% of the CDX universe are also shifting significantly (more than the 5 day average of 57%). The number of names wider than the index stayed at 49 as the day's range rose to 10bps (one-week average 9.5bps), between low bid at 180 and high offer at 190 and higher beta credits (-3.1%) outperformed lower beta credits (-2.46%). In IG, wideners were outpaced by tighteners by around 7-to-1, with only 11 credits wider. By sector, CONS saw 11% names wider, ENRGs 13% names wider, FINLs 0% names wider, INDUs 4% names wider, and TMTs 17% names wider. Focusing on non-financials, Europe (ITRX Main exFINLS) underperformed US (IG12 exFINLs) with the former trading at 157.31bps and the latter at 174.49bps. Cross Market, we are seeing the HY-XOver spread decompressing to 454.11bps from 447.31bps, but remains below the short-term average of 458.54bps, with the HY/XOver ratio rising to 1.52x, above its 5-day mean of 1.5x. The IG-Main spread compressed to 25bps from 27.5bps, and remains below the short-term average of 25.79bps, with the IG/Main ratio falling to 1.16x, above its 5-day mean of 1.16x. In the US, non-financials underperformed financials as IG11 ExFINLs are tighter by 7bps to 174.5bps, with 83 of the 104 names tighter. while among US Financials, the CDR Counterparty Risk Index fell 10.24bps to 229.18bps, with Finance names (worst) tighter by 57.43bps to 948.57bps, Banks (best) tighter by 17.1bps to 307.19bps, and Brokers tighter by 13.25bps to 282.08bps. Monolines are trading wider on average by 104.33bps (4.56%) to 2319.57bps. In IG12, FINLs underperformed non-FINLs (2.91% tighter to 3.84% tighter respectively), with the former (IG11 FINLs) tighter by 14.8bps to 493.1bps, with 20 of the 21 names tighter. The IG CDS market (as per CDX) is -4.7bps rich (we'd expect LQD to outperform TLH) to the LQD-TLH-implied valuation of investment grade credit (186.92bps), with the bond ETFs outperforming the IG CDS market by around 4.93bps. In Europe, ITRX Main ex-FINLs (underperforming FINLs) rallied 4.69bps to 157.31bps (with ITRX FINLs -trending tighter- better by 5 to 157bps) and is currently trading tight to its week's range at 0%, between 167.75 to 157.31bps, and is trending tighter. 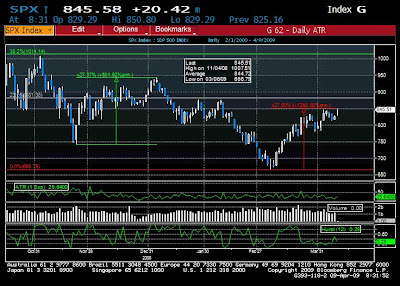 Main LoVOL (sideways trading) is currently trading in the middle of the week's range at 61.2%, between 109.66 to 103.11bps. ExHVOL outperformed LoVOL as the differential compressed to -7.84bps from -1.79bps, and remains below the short-term average of -1.93bps. The Main exFINLS to IG ExHVOL differential decompressed to 58.03bps from 54.13bps, and remains above the short-term average of 57.73bps. CDR LQD 50 NAIG091 -9.99bps to 262.65 (3 wider - 44 tighter <> 30 steeper - 20 flatter). CDX12 IG -7.25bps to 182.25 ($0.31 to $96.44) (FV -8.18bps to 223.69) (11 wider - 103 tighter <> 60 steeper - 63 flatter) - No Trend. CDX12 HVOL -3bps to 445 (FV -24.76bps to 592.18) (0 wider - 28 tighter <> 21 steeper - 9 flatter) - Trend Tighter. CDX12 ExHVOL -8.59bps to 99.28 (FV -3.68bps to 124.6) (11 wider - 84 tighter <> 46 steeper - 49 flatter). CDX11 XO -11.2bps to 542.9 (FV -11.55bps to 547.77) (5 wider - 25 tighter <> 20 steeper - 15 flatter) - No Trend. CDX11 HY (30% recovery) Px $+0.94 to $74.63 / -41.2bps to 1328.6 (FV -29.98bps to 1254.31) (13 wider - 73 tighter <> 70 steeper - 20 flatter) - Trend Tighter. LCDX10 (55% recovery) Px $+0.6 to $75.55 / -44.82bps to 1411.58 - Trend Tighter. MCDX11 +1.75bps to 221.75bps. - No Trend. CDR Counterparty Risk Index fell 10.24bps (-4.28%) to 229.18bps (0 wider - 15 tighter). DXY strengthened 0.19% to 85.53. Oil rose $2.33 to $51.71. Gold fell $1.68 to $878.82. VIX fell 1.67pts to 37.32%. 10Y US Treasury yields rose 6.3bps to 2.92%. S&P500 Futures gained 2.72% to 845. One of the more pervasive pieces of conventional wisdom is that senior classes in non-agency RMBS (read AAA) are safe and sound even in a defaults due to their first money nature that isolates them from the potential loss problems of the lower tranched classes. An interesting tidbit that has arisen as a result of a close read into the HR 1106 Bill "Helping families save their homes act" indicates that many deals' legal documents have a "bankruptcy carve-out". In these instances, bankruptcy-related losses above a de-minimis amount become allocated on a pro-rata basis across the capital structure, regardless of subordination. 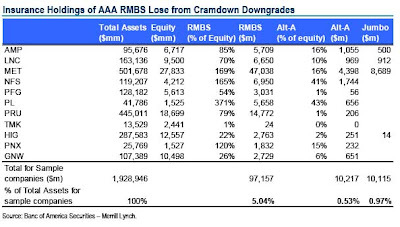 The obvious impact is that AAA tranches which previously had seen themselves as immune to any losses, would suffer impairments. This event is particularly an issue in the context of the proposed bankruptcy cramdowns by HR 1006. Additionally, the recent negative actions taking by many rating agencies could be predicated upon this particular often ignored feature, as rating downgrade could become much more prevalent not only for the junior classes, but for the AAA tranche as well. According to recent studies, the loss provision is typically found in shifting interest rate transactions, rather than excess spread transactions, which means it would affect the prime and Alt-A markets more than the subprime market. Estimates put shifting interest deals as two-thirds of outstanding Prime and Alt-A transactions. The table below presents a summary of vintages and shelves that possess this carve-out, which at a casual glance predominate the older vintage deals, which are considered relatively more insulated from overly aggressive underwriting and are estimated to have lower loss provisions. So what are the potential loss implications? At the surface: likely not much in terms of absolute losses. Bank of America estimates that the total amount of affected securities would be at just under $500 billion, based on the above assumption that 2/3rds of Jumbo and Alt-A are "shifting interest" and further estimates a 50% for affected securitizations (as not all shelves are impacted as the table above denotes). And based on Moody's dated estimates for losses, which peak at 1.3%, suggests total losses of around roughly $7 billion, potentially rising to $10 billion in an aggressive scenario. One corollary of the problem is the impact on CMO/CDO structures that are heavily levered against the AAA tranche, and for whom even a 1% impairment could be magnified up to 20x from leverage on what was considered a previously risk free asset class. However, the CMO/CDO impact is an issue we will consider at a later time, the most direct impact here is as pertains to life insurance companies who are holders of AAA RMBS tranches, as these are likely the ones who will be impacted the most from potential downgrade actions on AAA's. Additionally, the administration's decision yesterday to induct the Ins cos into the TARP hall of fame is likely a harbinger of the expectation for much larger upcoming capital needs, explaining the rush to provide preemptive guarantees for "contingent liabilties." come to think of it, they do bring up some valid points. - 10-20% of the company stock. Zero Hedge has previously discussed the aberration effects of daily gaps (up and down) as well as trading volume on the true state of market fair value indications. 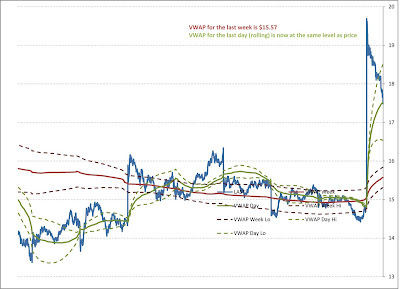 We present some VWAP (Volume-Weighted Average Price) data for our readers based on SPY index price and volume levels. We end up with some interesting conclusions. The SPY is currently trading at a price of 84.77 (10x less than the S&P500 it tracks). 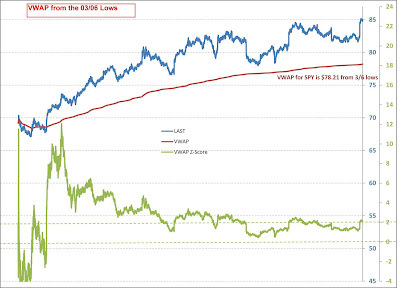 Curiously, since the 3/06 lows in SPY, the VWAP is $78.21, or an implied correlation to roughly 782 in the S&P500. 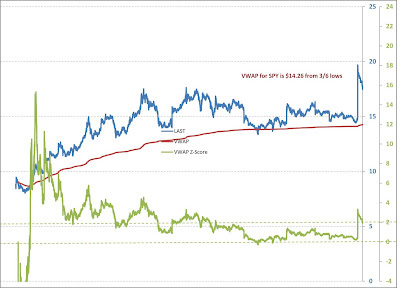 The VWAP number is around 2 standard deviations from its average, after hitting a a high of 12 standard deviations in the time chart. The VWAP is hardly rising at an aggressive level but is still positively trending – volumes are dwindling clearly, yet the market keep trading higher on lower and lower volumes. In more recent data, the daily (rolling) VWAP is around $83.11 which is way lower relative to the recent VWAP data and shows the opening gap exaggeration relative to real price volume action. 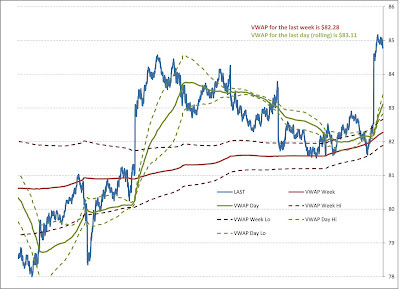 The chart below shows just how out of line with the VWAP and VWAP volatility the current day’s price action is. Looking at the culprit of today's shennanigans, WFC had a $15.57 VWAP in the current week, and today's VWAP and the price have actually converged, as the actual price has dropped. Lastly, for absolute value purists, we show that as a result of today's financial frenzy, the current bear market rally has just hit a 27.6% retracement, making it the biggest one since the down turn began: resistance or new support? In light of the market moving preannouncement by WFC, which as David Faber points out may have used some "leeway" with the marks on the company's mortgage related assets, it makes sense to present some California foreclosure data to show just how hot the refi market really is. We grab the following data and charts from the excellent Field Check Group blog. CA foreclosure background - in mid-2008 the foreclosure wave was artificially held back as a result of the CA law SB1137 enacted in Sept 2008. This also kept NOD’s and NTS’s at much lower levels than the actual defaults that were occurring. Other bubble states and several banks/servicers also went on random moratoria and the foreclosure wave was held back for the past six months. But just like so many other intervention and moratoria in the past, the problem just comes out the other side even more violent than if they would have done nothing. Adding insult to injury, the GSE’s announced this week that they were coming off moratorium, which could increase foreclosures by 20-25% alone. Two months from now, the foreclosure crisis will be top of the news once again catching everyone off guard because of the past six months ‘intervention’. Thanks Washington. The chart below highlights the top servicers in the nation and their monthly NOD, NTS and REO counts. As you can see, they all have gone through various foreclosure moratoria in one or more foreclosure stages in the past year but since the Obama plan was made known, volume has soared. Note - the NOD phase is 5-7 months away from foreclosure and the NTS phase 21-45 days away. The REO column will grow significantly in near-term months due to the surge in NTS in March and coming in April. For those of you that are curious as to total counts of new loan defaults bearing down on the state, the following is a 2-year chart of new NOD’s. March brought the first 50k+ count ever. From here the banks and servicers will try anything they can to get borrowers into mortgage mods before the Notice-of-Trustee Sale in filed 4-5 months down the road but ultimately most will make it to foreclosure sooner or later. But this time around the mix has changed. Mid-to-upper end loans — and homes attached to them — are going into the foreclosure process at the greatest rate ever. 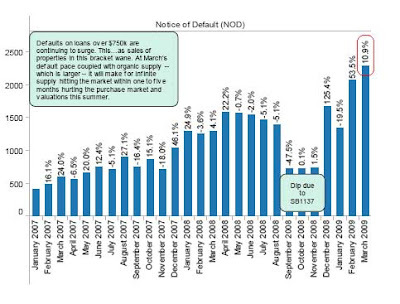 The following chart shows defaults on loans over $750k. This is trouble because the demand in the segment of the market is outpaced by foreclosure supply alone - where does that leave Ma and Pa Homeowner? Providing the ugly fundamental truth in the good ole days used serve as cold water for a rally... now - not so much: after all who cares for logic? Dave chimes in. This view that we are coming off a bear market that was overdone seems off base as well, in our view: Yes, the 57% peak-to-trough slide in the S&P 500 was larger than any other decline since the 1937-42 bear. But then again, reported earnings plunged 82% so perhaps it can be argued that to this day, the market has still not reflected that reality. As for the duration, this bear market lasted 17 months (if in fact, March 9th was the bottom) versus an average of 20 (not to mention the 62 months from 1937-42, and the 37-month bear that began in 1946). As an aside, look at the below chart. 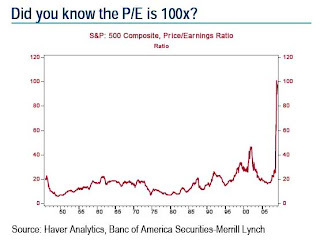 As of March, the trailing P/E on reported earnings was 100x, more than twice as expensive as the market was at the peak of the tech bubble, and the most pricey it has ever been! Is the economy really turning around? It’s amazing how everyone latches on to any positive piece of data to claim that the recession is over and a new bull market about to begin. Go back to prior recessions, and indeed you will see that ISM, new home sales and durable goods shipments have risen 38% of the time; retail sales have actually risen half the time and new home sales 30% of the time. In our view, it just goes to show that (i) it is what happens the rest of the time that matters more, and (ii) a reminder that nothing moves in a straight line. FOMC members noted that, relative to their expectations, conditions had deteriorated since their last meeting in January. Of "particular note" was the "sharp fall in foreign economic activity." It was not just FOMC members whose views had shifted to the downside but also those of the Fed staff. The Fed staff now expect growth to "flatten out gradually over the second half of this year and then to expand slowly next year" as credit conditions improve. They noted that this suggests that the unemployment rate will rise "more steeply into early next year before flattening out at a high level." This new outlook helps to explain the rather dramatic increase in the size of the Fed's balance sheet which was announced at this meeting. The minutes show a mix of views, although it seemed generally agreed that "the uptick in housing starts in February" was not "the beginning of a new trend." Regarding the consumer outlook, the views were more mixed. The minutes show "participants noted some tentative signs of stabilization in consumer spending." However, other participants "suggested that strains on household balance sheets from falling equity and house prices, reduced credit availability, and the fear of unemployment" could "damp consumption growth." The trade deficit shrank to $26.0B in February from $36.2B in January on a collapse in imports, as the deep US recession continues, combined with a slight upturn in exports for the first time since last July. The numbers will likely take our GDP forecast for 1Q up by about 1 to 2 percentage points, but the tracking will remain deep in recession territory. In a separate report, import prices rose 0.5% m/m in March, the first gain since July, on higher petroleum prices. Ex petroleum, prices fell 0.7% m/m and were at -3.7% y/y - highlighting ongoing disinflation trends at work in the US economy. Imports were crushed again, seeing a 5.1% m/m decline in February, and are running at -51.6% annualized on a 3-month trailing basis. Almost no category was unscathed in the report. Capex goods imports dropped another 6.0%, similar to January and suggest an even weaker 1Q capex profile than the 29.0% q/q annualized decline in our GDP add-up. Industrial supplies fell 9.3% m/m on falling commodity prices and lower volumes. Consumer goods were off 3.9% m/m and this was flattered by a 21.4% gain in pharma products, so the numbers that reflect consumer demand were weaker still. On the export side, activity was up 1.6% m/m on stronger tech exports as well as consumer goods and autos (the latter was the result of resumed production after the December/January shutdowns). The real trade deficit (using the BLS prices to deflate) narrowed to $41.8B in February from 52.3B in January. Well, if public policy is aimed at resurrecting a new credit-creation cycle, then we suppose the grade it deserves is a big fat F. Then again, to think that we can actually embark on a whole new credit cycle at a time when the outstanding volume of private sector debt is equivalent to a record 180% of national income, well above the 120% long-run norm, is perhaps just a little pie-in-the-sky. Households, in particular, are choking on an amount of debt and debt-service relative to net worth and cash flows that is practically without precedent, so why would they line up for more even with the government doing all it can to entice them to borrow and spend? Indeed, consumer credit fell $7.5 billion or at a 3.5% annual rate, the fourth decline in the past five months. Over this time, outstanding consumer credit has contracted at a record $45 billion annual rate (-1.7% SAAR). Initial claims for unemployment benefits fell by 20K to 654K in the first week of April. This was below both consensus and BAS-ML estimates. The four-week average remained essentially unchanged at 657K, though still nearing in on the 1982 record high of 674K when the unemployment rate was 10.8%. We've yet to see any stabilization in the pace of layoffs as the labor market has yet to find a bottom. Our early tracking for April payrolls is for a 700K monthly decline following the 663K drop in March. Continuing claims jumped 95K to over 5.8M for the 10th consecutive week of record highs. These numbers are clearly signaling a more rapid deterioration in the labor markets and speak to the longer duration of unemployment that more and more workers are grappling with. After exhausting regular benefits, over 1.5M people rolled into the extended Federal program to receive additional support for several more weeks. With more companies cutting jobs and fewer hiring, we believe the unemployment rate will reach 10% this summer. Wholesale inventories fell by 1.5% m/m in February there is much more de-stocking needed, in our view, to realign inventories with sales. The inventory-to-sales ratio (I/S) only edged down to 1.31 months from a cycle high of 1.34 months (the ratio needs to decline to about 1.12 to 1.14 months), which likely means continued production cuts and job layoffs in the coming months. The durable goods sector saw the most improvement in the inventory-to-sales ratio (1.82 months in February versus 1.90 in January), where the auto, furniture, machinery and tech sectors managed to make at least some dent in their excessive stockpiles. However, there is no industry that has managed to completely realign its inventories yet. The nondurable goods sector inventories held steady at 0.89 months, just off the cycle high of 0.9 months. The build-up in this sector has not been as excessive as in the durables sector since nondurable inventories are easier to manage through business cycles. Still, the chemical and petroleum industries have not fared as well in inventory management: the I/S ratios continued to press to new cycle highs in February. Led by a 10.5% increase in petroleum import prices, the price of all imports posted a 0.5% gain in March. The median of analysts' expectations was for a steeper 0.9% increase. This was the first increase in import prices in eight months. We expect the ongoing slowdown in global business activity will, however, put downward pressure on import prices. For the eighth consecutive month, the price of nonpetroleum import prices fell. And, for the third consecutive month, the decline was 0.7%. These developments should help ease general inflationary pressures. The March decline in nonpetroleum import prices was led by a 2.3% fall in the price of nonpetroleum industrial supplies and materials. The price of food imports was off 1.0%. Among the other nonpetroleum import categories, nonauto consumer goods import prices were off 0.5%, capital goods prices were down 0.3% and automobile prices slipped 0.2%. The nonmanufacturing recession continued in March as the ISM nonmanufacturing index recorded its 6th consecutive reading below 50. The ISM nonmanufacturing composite index fell from 41.6 in February to 40.8 in March. The median of analysts’ projections was 42.0. Only one of the 18 industries in the survey, real estate, rental and leasing, reported growth in March. In a special question, only eight of the 18 industries expected to derive some benefit from the stimulus package. Last week’s report indicates that a revival in economic activity in the service sector is not imminent. The new orders index, which was at 40.7 in February, posted a reading of 38.8 in March. The employment index fell five percentage points to 32.3 in March. Only 7 percent of survey respondents reported higher employment in March (down from February’s 10 percent share) while 43 percent reported lower employment in March (up from February’s 38 percent share). The contraction in new orders and employment suggests that nonmanufacturing activity will remain weak in the months ahead. The prices index fell from February’s reading of 48.1 to 39.1 in March. Foods, energy and energy-derivative products and metals were the commodities that were reported down in price. So much for the big inflation view coming to fruition. Helped by low interest rates, mortgage applications rose 4.7% for the week ended April 3rd. This is the fifth consecutive increase in mortgage applications (92.5% gain) and suggests that the demand for housing is strengthening. One factor helping the housing sector is low mortgage rates. While the 30-year fixed rate mortgage rose 12bps to 4.73%, this is the fifth consecutive week in which the rate was below 5.0%. We expect mortgage rates to remain low through the end of the year. Purchase applications advanced 11.1% for the week ended April 3. Purchase applications have now increased 5 consecutive weeks and the current increase is the largest since the end of November. The increase in purchase applications over this five week period is a stunning 25.9%. Not to be outdone, mortgage applications for refinancing also increased for the fifth consecutive week. The weekly advance was 3.2%, while the five week gain was 122.4%. The increase in refinancings suggests that consumers are fixing their balance sheets by taking advantage of the low mortgage rates to reduce their monthly mortgage payments. Technicals: Where Is The Pullback? What Pullback? After a 25% rally in the past 40 days, is the market set to undo its 45% loss from the S&P500 all time highs? Many bulls are now claiming that now all is back to normal, and that despite the loss of the securitization product, the government will be happy to releverage consumers and companies to historic credit levels following the bail out mantra "take out debt now, spend tomorrow, save... oh, at some point." In the meantime the question of whether the slow down in the macro economic collapse is an indication of a recovery or just, as David Rosenberg states, a "slowing down in the collapse." Regardless, the market's greed and optimism seem to be back, ignoring all bad news (WMT up on a big miss in comp store sales, BRK downgrade) and rushing higher on anything remotely perceived as good. So while the fundamentals (or at least the positive side thereof) point higher, what do technicals imply? What happens after a 20%-plus rally (3/6 to 4/3)? Since 1900, a 7% pullback, implying an S&P 500 of 780 or so . . . . The question on our mind (and many investors’) is whether this rally is a Bear trap or the start of a Bull. For either camp (bull or bear), a market correction/ pullback would be helpful, allowing short sellers to cover and providing an entry point for real money buyers. But this market has been frustrating, as equities have shown an “underlying bid” and not provided the correction/pullback many are seeking. We believe an 8%-10% pullback will be seen in coming weeks and supported by the historical pattern following a 20%-plus gain (in 40 days or less). Since 1900, the Dow (as a proxy for equities) has risen 20% or more within 2 months, 24 times. In the month following this gain, the Index has on average fallen 7% from a peak (see Figure 3). Using the S&P 500 recent closing high of 842 implies 783. 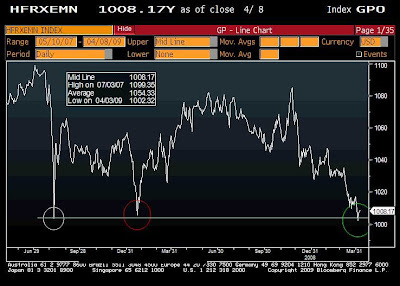 We still see a Final Low in the 750-775 range in the coming months . . . . We believe the data support our notion that US equities are in “proximity to the bottom.” Our view is based on the notion that risk appetite naturally improves as the economy recovers, which implicitly assumes the US economy troughs midyear with a return to growth in 2H, consistent with J.P. Morgan Economics. It is also supported by the idea that breaching a 12-year low in the S&P 500 in early March signaled we were at an important juncture in this Bear. In our idealized view, we believe a final low is ahead of us in the coming months, with an S&P 500 close in the 750-775 range as the signal for us to make a big move into equities. In other words, absent incrementally negative news, a close in the 750-775 range is probably the level we see this Bear market ending. Another interesting data point presented by JPM is the shift in sector leaders year to date: on an extended basis Technology and telecom have been by far the best performers for the year (the NASDAQ is now solidly in positive YTD territory on expectations that it will be the first sector to recover, tech earnings next week will be interesting), while over the past month, the leadership has been concentrated in the most shorted sectors: financials and discretionary, leading one to argue yet again that the major move in March has been forced by the covering action after the S&P failed to break the 666 low. Ken Lewis: "The Fed Has Been Kind Of A Hero"
Is The Fed Telegraphing Stress Test Results? Are Sparks Flying At NRUC? UK To Provide Liquidity To US?